Haida /ˈhaɪdə/  (X̱aat Kíl, X̱aadas Kíl, X̱aayda Kil, Xaad kil, ) is the language of the Haida people, spoken in the Haida Gwaii archipelago off the coast of Canada and on Prince of Wales Island in Alaska. An endangered language, Haida currently has 14 native speakers, though revitalization efforts are underway. At the time of the European arrival at Haida Gwaii in 1774, it is estimated that Haida speakers numbered about 15,000. Epidemics soon led to a drastic reduction in the Haida population, which became limited to three villages: Masset, Skidegate, and Hydaburg. Positive attitudes towards assimilation combined with the ban on speaking Haida in residential schools led to a sharp decline in the use of the Haida language among the Haida people, and today almost all ethnic Haida use English to communicate. Classification of the Haida language is a matter of controversy, with some linguists placing it in the Na-Dené language family and others arguing that it is a language isolate. 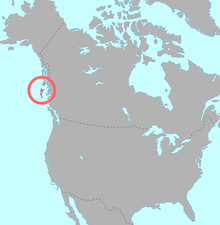 Haida itself is split between Northern and Southern dialects, which differ primarily in phonology. The Northern Haida dialects have developed pharyngeal consonants, typologically uncommon sounds which are also found in some of the nearby Salishan and Wakashan languages. The Haida sound system includes ejective consonants, glottalized sonorants, contrastive vowel length, and phonemic tone. The nature of tone differs between the dialects, and in Alaskan Haida it is primarily a pitch accent system. Syllabic laterals appear in all dialects of Haida, but are only phonemic in Skidegate Haida. Extra vowels which are not present in Haida words occur in nonsense words in Haida songs. There are a number of systems for writing Haida using the Latin alphabet, each of which represents the sounds of Haida differently. While Haida has nouns and verbs, it does not have adjectives and has few true adpositions. English adjectives translate into verbs in Haida, for example 'láa "(to be) good", and English prepositional phrases are usually expressed with Haida "relational nouns", for instance Alaskan Haida dítkw 'side facing away from the beach, towards the woods'. Haida verbs are marked for tense, aspect, mood, and evidentiality, and person is marked by pronouns that are cliticized to the verb. Haida also has hundreds of classifiers. Haida has the rare direct-inverse word order type, where both SOV and OSV words orders occur depending on the "potency" of the subject and object of the verb. Haida also has obligatory possession, where certain types of nouns cannot stand alone and require a possessor. These people would fain have their services etc. entirely in English. It has been by sheer determination that I now have the whole service (except hymns and canticles) in the vernacular. Haida features phonemic tone, the nature of which differs by dialect. Several orthographies have been devised for writing Haida. The first alphabet was devised by the Alaska Native Language Center (ANLC) for Kaigani Haida in 1972, based on Tlingit orthographic conventions, and is still in use. The linguist John Enrico created another orthography for Skidegate and Masset Haida which introduced ⟨7⟩ and ⟨@⟩ as letters and did away with the distinction between upper and lower case, and this system is popular in Canada. Robert Bringhurst, for his publications on Haida literature, created an orthography without punctuation or numerals, and few apostrophes; and in 2008 the Skidegate Haida Immersion Program (SHIP) created another, which is the usual orthography used in Skidegate. Other systems have been used by isolated linguists. Haida consonants are represented as follows. "go, come inside" "be sick" "leave, throw away" "wear"
Sán uu dáng G̱íidang How do you do? Sán uu dáng kya'áang? What's your name? Gíistgaay gúust uu dáng Ḵ'wáalaagang? Whose moiety do you belong to? ^ Keen also translated 3 books of the New Testament into Haida: Acts, published in 1898; and the gospels of Luke and John, published 1899. Hatch, Melville H. (Autumn 1957). "A Biographical Memoir of Rev. Keen". The Coleopterists Bulletin. XI: 62–64. JSTOR 3999009. ^ This may occur after FSS, for instance kwasaaw 'pig' + -aay 'DF' becomes kwasiwaay, see Enrico (2003:17). ^ The suffix -(a)ng behaves like -aay tonally, thus for instance awáng '[someone's] own mother' has high tone on the suffix. ^ Hammarström, Harald; Forkel, Robert; Haspelmath, Martin, eds. (2017). "Haida". Glottolog 3.0. Jena, Germany: Max Planck Institute for the Science of Human History. ^ Hume, Stephen (17 March 2014). "A high-tech fight to save B.C. 's indigenous languages". The Vancouver Sun. ^ Beolens, Bo; et al. (2009). The Eponym Dictionary of Mammals. JHU Press. p. 220. ^ Atlas of the World's Languages in Danger (3rd ed.). UNESCO. 2010. ISBN 978-92-3-104096-2. Retrieved 19 July 2016. ^ a b c Lachler, Jordan. "Haida Language Mainpage". Retrieved 23 May 2008. ^ "FirstVoices: Hlg̱aagilda X̱aayda Kil Welcome Page". Retrieved 19 January 2013. ^ a b c d e Lachler, Jordan. "Ways of Writing Haida". Retrieved 25 November 2012. ^ a b c Harvey, Chris (2008). "Haida Language". Retrieved 25 November 2012. ^ Bringhurst, Robert (2011). A Story as Sharp as a Knife: The Classical Haida Mythtellers and Their World. Appendix 1: Douglas & McIntyre. p. 429. ISBN 1553658396. ^ Lachler, Jordan (22 June 2016). "Dictionary of Alaskan Haida" (PDF). Dictionary of Alaskan Haida. Sealaska Heritage Institute. Retrieved 22 June 2016. Enrico, John; Stuart, Wendy Bross (1996). Northern Haida Songs. University of Nebraska Press. ISBN 0-8032-1816-8. Enrico, John (2003). Haida Syntax. University of Nebraska Press. ISBN 0-8032-1822-2. Enrico, John (2004). "Toward Proto – Na-Dene". Anthropological Linguistics. 46 (3): 229–302. Lawrence, Erma (1977). Haida dictionary. Fairbanks: Alaska Native Language Center. Schoonmaker, Peter K.; Von Hagen, Bettina; Wolf, Edward C. (1997). The Rain Forests of Home: Profile of a North American Bioregion. Island Press. ISBN 1-55963-480-4. Andersen, Doris. 1974. "Slave of the Haida." Toronto: Macmillan Co. of Canada. Dauenhauer, Nora Marks. 2008. "The Battles of Sitka, 1802 and 1804, Anooshi Lingit Aani Ka, Russians in Tlingit America." University of Washington Press. Dawson, George M. (1880). Vocabulary of the Haida Indians of the Queen Charlotte Islands (microform). Free Download & Streaming : Internet Archive. Retrieved 26 August 2012. Dürr, Michael & Egon Renner. 1995. The History of the Na-Dene Controversy: A Sketch. Language and Culture in North America: Studies in Honor of Heinz-Jürgen Pinnow, ed. by Renner, Egon & Dürr, Michael. 3-18. (Lincom Studies in Native American Linguistics 2). Munich: Lincom Europa. Enrico, John. 1983a. "The Haida Language." The Outer Shores, edited by Scudder, G. E. and Gessler, Nicholas. Queen Charlotte City, B.C. : Queen Charlotte Islands Museum Press. pp. 223–248. Enrico, John. 1983b. "Tense in the Haida Relative Clause." International Journal of American Linguistics 52:91–123. Enrico, John. 1986. "Word Order, Focus and Topic in Haida." International Journal of American Linguistics 49:136–166. Enrico, John. 1991. The Lexical Phonology of Masset Haida. (Alaska Native Language Center Research Papers, 8.) Fairbanks: Alaska Native Language Center. Enrico, John. 1998. "Remarks on Pitch in Skidegate Haida." Gengo Kenkyu 12:115–120. Enrico, John. 2003. Haida Syntax. (2 volumes). Lincoln, NE: University of Nebraska Press. Enrico, John. 2005. Haida Dictionary: Skidegate, Masset, and Alaskan Dialects. (2 volumes). Fairbanks: Alaska Native Language Center; Juneau: Sealaska Heritage Institute. Fisher, Robin. 1992. "Contact and Conflict: Indian-European Relations in British Columbia, 1774–1890." UBC Press. Greenberg, J.H. 1987a. Language in the Americas. Stanford, CA: Stanford University Press. Greenberg, J.H. 1987b. "The Na-Dene Problem". In Greenberg (1987a), pp. 321–330. Harrison, Charles. 1925. "Ancient Warriors of the North Pacific; The Haidas, Their Laws, Customs and Legends." London, H. F. & G. Witherby. Harrison, Charles; Royal Society of Canada (1895). Haida grammar (microform). Free Download & Streaming : Internet Archive. Retrieved 26 August 2012. Hibben & Carswell (1865). Dictionary of Indian tongues (microform) : containing most of the words and terms used in the Tshimpsean, Hydah, & Chinook, with their meaning or equivalent in the English language. Free Download & Streaming : Internet Archive. Retrieved 26 August 2012. Keen, John Henry (1906). A grammar of the Haida language. Society for Promoting Christian Knowledge; Free Download & Streaming : Internet Archive. Retrieved 26 August 2012. Levine, Robert D. 1979. Haida and Na-Dene: A New Look at the Evidence. International Journal of American Linguistics 45(2).157–70. Manaster Ramer, Alexis. 1996. "Sapir's Classifications: Haida and the Other Na Dene languages." Anthropological Linguistics 38:179–215. Pinnow. H-J. 1985. Das Haida als Na-Dene Sprache. (Abhandlungen der völkerkundlichen Arbeitsgemeinschaft, Hefte 43–46.) Nortorf, Germany: Völkerkundliche Arbeitsgemeinschaft. Pinnow. H-J. 2006a. Die Na-Dene-Sprachen im Lichte der Greenberg-Klassifikation. / The Na-Déné Languages in Light of Greenberg's Classification. Zweite erweiterte Auflage / Second revised edition. Bredstedt: Druckerei Lempfert. Pinnow. H-J. 2006b. Sprachhistorische Untersuchung zur Stellung des Haida als Na-Dene-Sprache. (Unveränderte Neuausgabe aus INDIANA 10, Gedenkschrift Gerdt Kutscher. Teil 2. Berlin 1985. Mit einem Anhang = Die Na-Dene-Sprachen im Verhältnis zum Tibeto-Chinesischen.) Bredstedt: Druckerei Lempfert. Rosman, Abraham. 1971. "Feasting with Mine Enemy: Rank and Exchange among Northwest Coast Societies" Columbia University Press. Ruhlen M. 1998. "The Origin of the Na-Dene". Proceedings of the National Academy of Sciences of the United States of America. 95, no. 23: 13994-6. Sapir, Edward. 1915. The Na-Dene Languages: A Preliminary Report. American Anthropologist 17.534–558. Stearns, Mary Lee. 1981. "Haida Culture in Custody." University of Washington Press. Swanton, John R. 1905. Haida Texts and Myths. Skidegate dialect. (Bureau of American Ethnology Bulletin 29.) Washington, D.C.: Smithsonian Institution. Swanton, John R. 1908. Haida Texts. Masset Dialect. (Memoirs of the American Museum of Natural History, vol. 10, part 2.) Leiden: E. J. Brill.